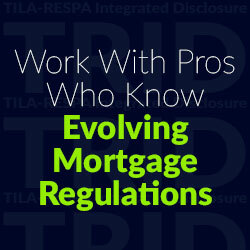 Beginning with loan applications taken October 3, 2015, the CFPB (Consumer Finance Protection Bureau) rolled out the new TRID (TILA-RESPA Integrated Disclosure) forms. These forms replace the GFE (Good Faith Estimate), TIL (Truth In Lending) disclosures, as well as the HUD-1 closing settlement statement that mortgage consumers have been used to seeing for years. So, why am I writing about this now? Well, anyone who has not gotten a mortgage – including a re-fi – since this was introduced will face some changes at their next closing. Who will not be affected? All-cash buyers and borrowers obtaining a reverse mortgage. Whereas in the past, your mortgage pro might be able to facilitate same-day closings once loans were “approved to close” by the underwriter, there is now a 3- to 6-day waiting period from the time the borrower acknowledges receipt of the closing disclosure (that is, signs and returns to the lender). It’s important for consumers to know this. And it’s important for customers to review the Closing Disclosure and sign or speak with their lender regarding changes they may want as soon as possible to avoid any potential delays in closing. This also tends to reduce the number of “surprises” at closing. For instance, for many fees, there is a $0 tolerance to changes, so, for example, if the appraisal fee was higher than quoted and not re-disclosed to the borrower, the lender is not able to charge the difference in the fee to the borrower. This helps to provide clarity to the borrower prior to closing and reduces the changes that the consumers were not aware or prepared for at closing. With changes like these, it’s even more important for borrowers to communicate with their lenders throughout the process and provide documents as quickly as possible when requested. A one- or two-day delay in providing documents can lead to a closing delay, resulting in extension fees, both with the ratelock on the loan and any contract extensions for the purchase. “Thus, we are focusing on how our lender clients can increase communications with settlement agents and investors to ensure that they can close and sell loans without TRID-induced delay,” Salzano says.